With all the talk about the music of DEVICE 6, we thought it would be cool to show you some of the tracks that didn’t make it, and various tests and demos. 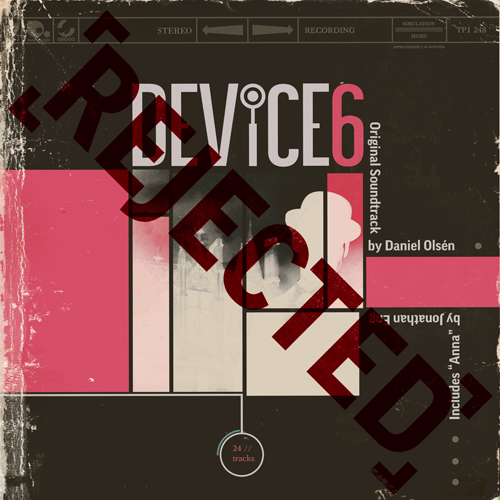 So today we’ll have a guest-blogger: composer of DEVICE 6 music, Daniel Olsén. Take it away Mr. Olsén! I was really excited about this project. The idea of doing a score full of brass and strings inspired by the 1960s was really appealing to me. That is something I had always wished I could do, but had never tried. Before starting to write the music, we created a collaborative playlist on Spotify and I didn’t listen to anything else for weeks. For different reasons I couldn’t start right away, so when I finally sat down I was full of inspiration and ideas. The concept was, broadly, ”1960s inspired spy music with analogue synthesizers and Latino beats, played in cellar bar in the middle east filled with opium smoke”. Because the game was so different, and I had only seen a few screens and concept movies, I didn’t really know what it would be like to play it. I had read the script and Simon had explained a few scenarios and how it would work, but it was still hard to imagine the “gameplay”. So I came up with this imaginary scenario that I was writing a movie soundtrack independently of the project, and that it just so happened that Simogo wanted to use all of it for their game. This idea together with the very inspiring setting and project’s concept itself really worked to get my mind going. So before the first chapter was even done I think had written about 20 songs. Simon then picked songs that would fit with different scenarios and others were discarded. I remember Simon told me early on: “We want to do unexpected things. 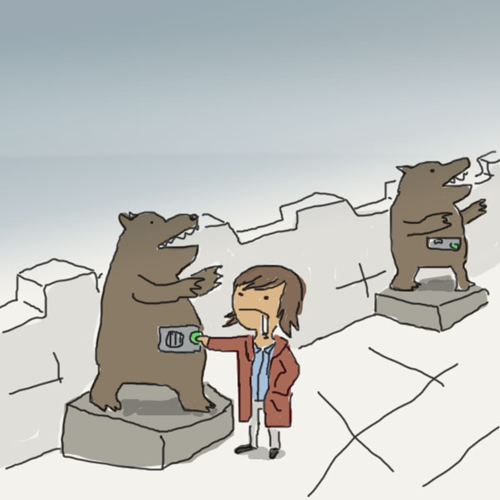 Like, where would you least expect to see the stuffed bears? On the bridge. We want contrasts like that”. I tried to have a similar approach to the music as well, and I think it had an impact on more or less all of the songs. Here is an early version of Code Erotica. As you can hear it’s quite different from the final one. The bass is played one octave up, it lacks swing and the melody is not as jumpy and playful as in later versions. One of the interesting thing about working with Simon is that he will sometimes mess with my songs to show me what he is after. I had a hard time with this on our first projects but now I really appreciate it. It makes me have a more relaxed approach to writing music and feel less like everything is carved in stone. When I first sent Code Erotica to him, he pitched it down, turned it backwards and sent it back to me. Something similiar happened with Revelation Haze. Simon mixed it with Eisenhower’s Farewell Adress speech, and sent it back to me, to communicate the overall feel of the game. I think we all got goosebumps from it! This became one of the corner stones of audio inspiration for the game. I was also asked to create a message tone that would catch the attention of the player. I thought it would be fun to take inspiration from the iPhone message tone, given the theme of the game. Here are the versions I sent him. I think it turned out quite iconic! Quite a few songs and concepts for songs were discarded, and here are a few of them. This is a really early song that didn’t make it. I think it has kind of a 60s cop show vibe to it. I think we skipped it because there were better songs to include instead. You probably know Jonathan Eng wrote a fantastic pop song for the game. But Simon also also asked him to record some random twangs on the guitar, like the ones at the beginning of a chapter. I got some of the recordings and tried to write something with it. This song almost made it in to the game. The game also needed some classic “shopping music”. I wrote two versions for it, but we thought they were a little too much, and settled on a simple version of Lounge Meringue. I made many variations of the main theme. This one was considered for the credits briefly but, although we really liked it, it didn’t really fit the mood of the game. This is another version of the main theme. Simon wanted a piano lounge version. But again I felt I didn’t have the skills to pull it off so I didn’t want to use it. Part of this one is actually used in the game anyway, but kind of hidden. The strangest request I got, was when Simon asked for the main theme done in the style of the song “The Stripper” for the credits. I spent a lot of time on it, but I felt my music skills were insufficient and I didn’t like how it turned out. So it was cut. And that’s probably a good way to round off! It ended up being quite a long post, but I hope you enjoyed it! I would seriously pay for this soundtrack again (and so would tons of other people) if you released it on vinyl. It would be the perfect aesthetic for the art and music to coexist upon, besides the brilliant app you have created.